This is the home of Ylava Skarp in Leksand, Sweden. 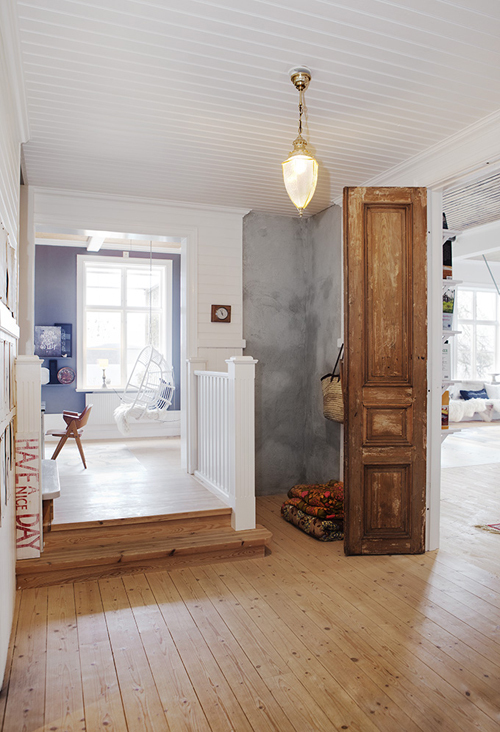 Her stunning house was recently featured in Swedish magazine PLAZA Interior. 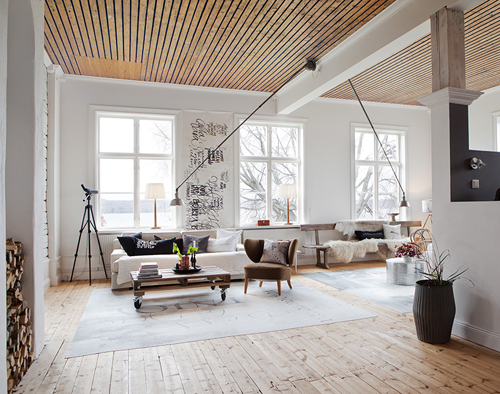 I love the high ceilings (image above), the combination of white, wood and black (image below) and that typical Swedish wood burning stove. Amazingly beautiful interior, especially all the graphic art on the wall and behind that small couch with the black cover. I love the charcoal walls and furniture. So cool! WOW, love it. So in love with it. Those Swedish people, Swedes?, Dutch?…i always forget, seem to have such good taste. Hi, amazing home!! Love it!! Have a great day!! Cool and cozy atmosphere! Love it! the fireplace is awesome! and I like that hanging chair a lot! Beautiful work! I love the pendant lamp on the ceiling. What model is it? Love every thing… great atmosphere! The use of all the different textures, sizes, and styles of wood is beautiful. such a lovely house… i want ! What is the name of the molded plywood chair in the second image?? Stunning!